What to wear is the most common question I am asked by my clients in the lead up to their sessions. 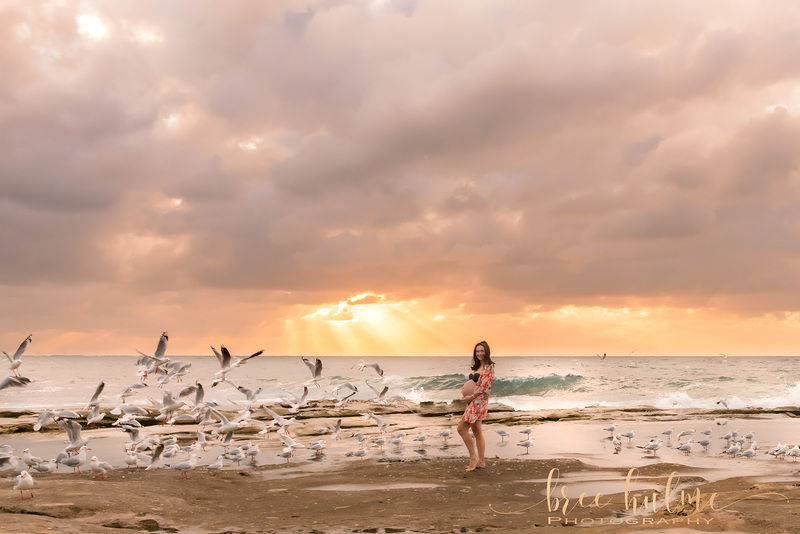 Whether it is for a family session, newborn portraits or a maternity session. You can see helpful hint of what to wear for your Newborn and Family sessions in my previous blog posts. 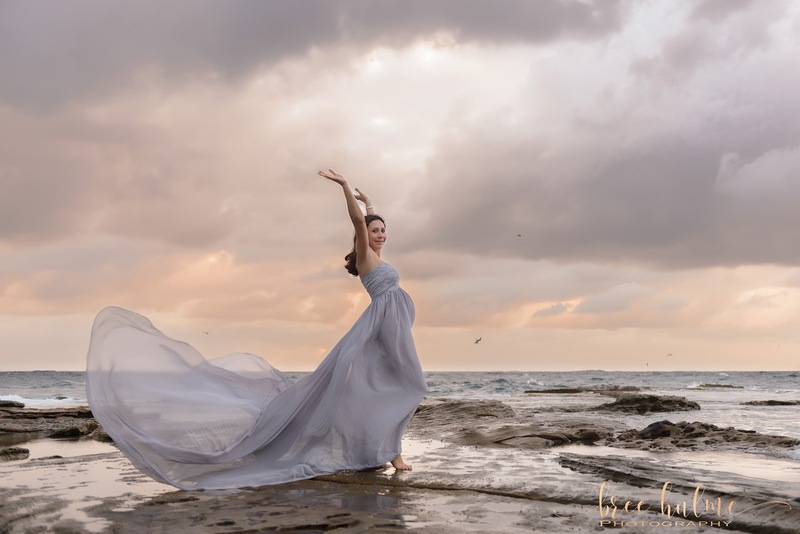 Here I will give you a few tips when it comes to picking your outfits for a maternity session to create the style of portraits you are wanting to create with me. 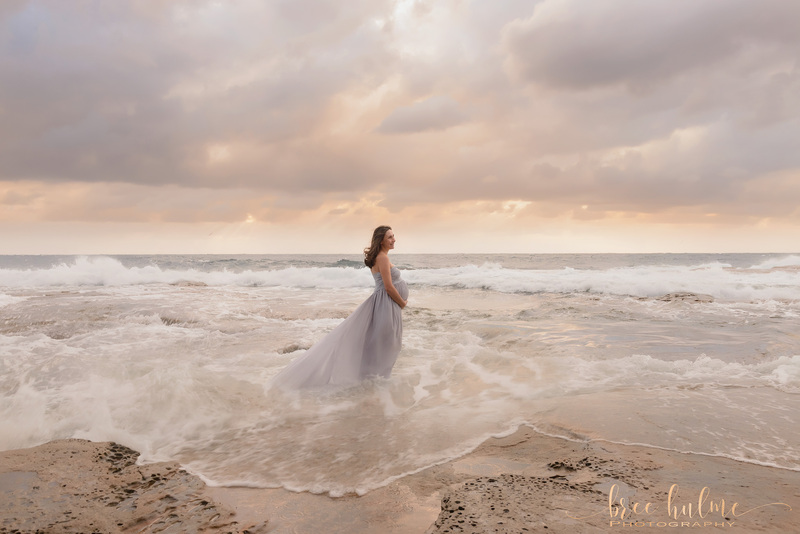 What I love most about maternity portraits is celebrating your amazing body. A tiny human is growing inside of you, and your body knows exactly how to do this. I love the curves of a pregnant woman, I love showing the connection between mother and child, even at this prenatal stage. The clothes I love to see expectant mothers wear accentuate this, showing curves, showing skin and being very natural. They cling to the shape of your body, showing your curves not hiding them. When selecting an outfit from your wardrobe, think about the silhouette it gives, choose one that shows off your beautiful growing belly, your bust, your hips. Some mums I know cringe at this, feeling self-conscious and shy about showing off their beautiful bodies, it is my job to pose you and use the light to flatter your changing body and shape. I adore lace, silk, softness, sensuality. And the gowns and drapes I have on offer for my clients to use during sessions all fit with what I love. Subtle, neutral, feminine. Of course, many of my clients bring their own beautiful clothes and accessories to use during a session as well. You will see some examples of the different gowns, dresses and drapes I have on offer below and how they can be used in different styles of portraits. 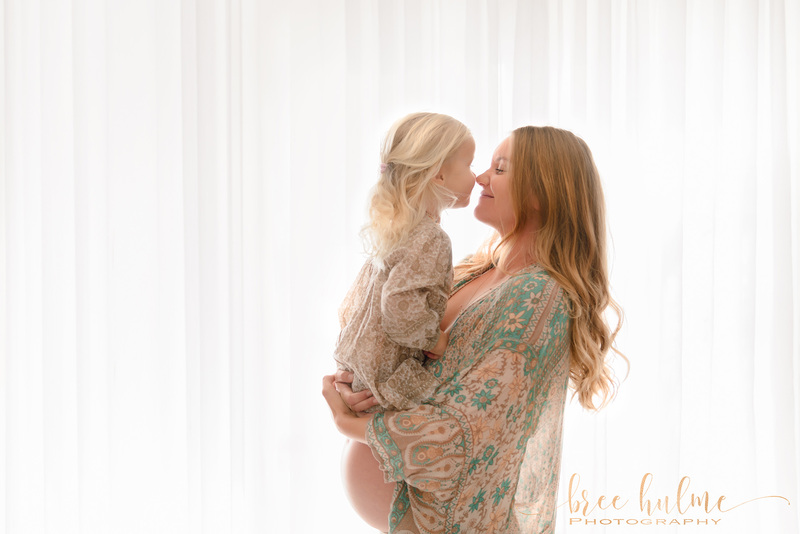 In-studio maternity sessions can offer a beautiful, intimate setting your portraits, that is not always possible to achieve when out on location, especially if you are feeling a little self-conscious or shy. Of course not all portraits are done with this minimal amount of clothing. Sometimes the most simple outfit, gives the most beautiful results. In this image, a simple tank top and leggings worked beautiful to accentuate and highlight this beautiful Mumma-to-Be’s Baby Bump. Int he second and third portrait, the Mum-to-Be bought her own beautiful Kimono to wear. Similarly, a beautiful lace robe, gives just a modicum of modesty, whilst still showing off that beautiful baby bump, and does not detract from the joy of impending motherhood. In studio, we have a range of lace maternity dresses in white and black, which clients are welcome to use during the shoot. I love these dresses, because they allow you to be covered whilst still giving the hint of skin, and accentuate that beautiful curve of your growing belly. And of course there are gowns which are more conservative, but offer some beautiful details and still show off that beautiful maternity shape. When we are out of location, many of the same gowns and dresses are used in my photo sessions. It is a personal choice how much you wish to bare in a public setting and choosing your underwear carefully for the gowns you wish to use will help you cover or reveal as you wish. 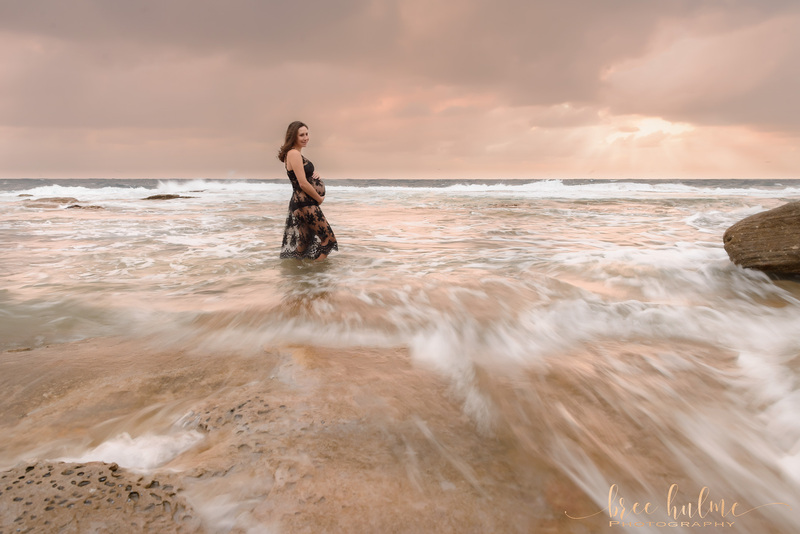 And as you will see being out on one of the beautiful beaches for a sunrise maternity shoot often means we all get our tows wet. On location we get a much larger area to shoot in an so we can have some fun with the long train on some of the gowns, adding some drama and movement to the portraits. 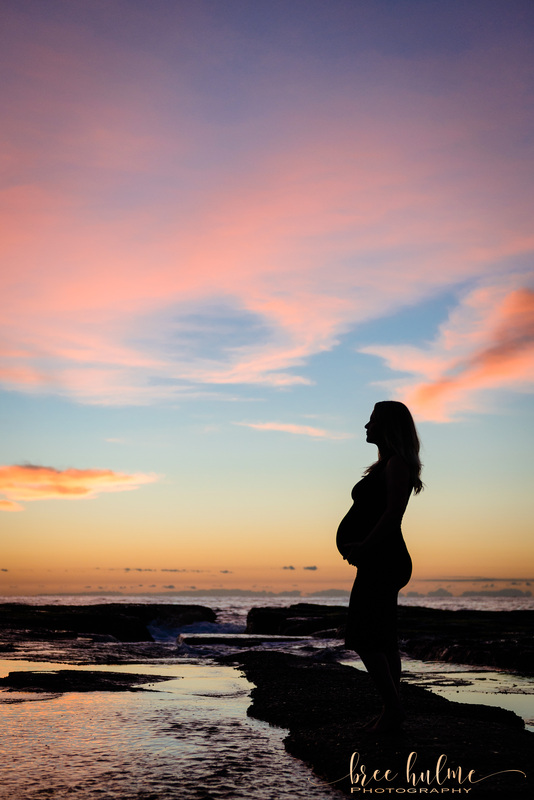 Shooting maternity portraits at sunrise feels almost poetic to me, a new day and a new mother, a new life. 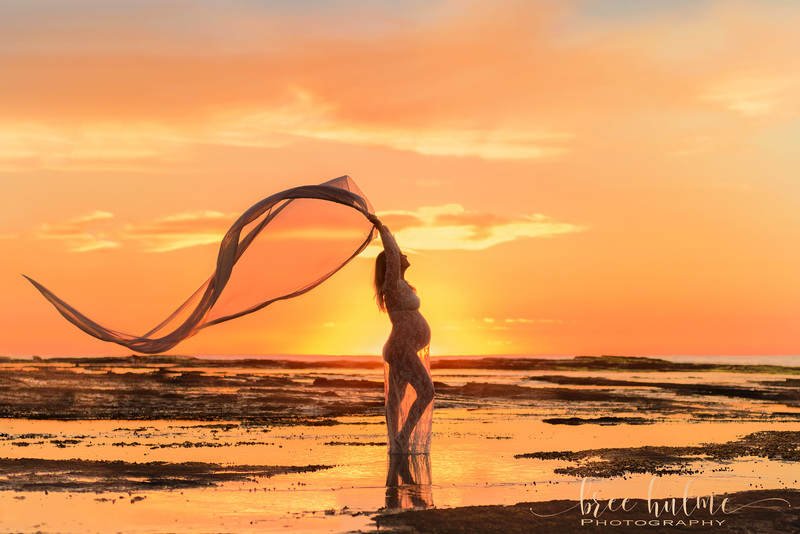 I love to use those rich beautiful colours of sunrise and create silhouettes to accentuate your growing belly and that new life. Choosing an outfit that snuggly hugs your bump is ideal for these beautiful silhouettes, and sometimes a beautiful gown can add to the drama of it all as well. Shooting at the beach almost means it is perfectly acceptable to be in a simple bikini and kimono as well. If you have an idea in mind of something you would love to wear I would love to discuss this with you. 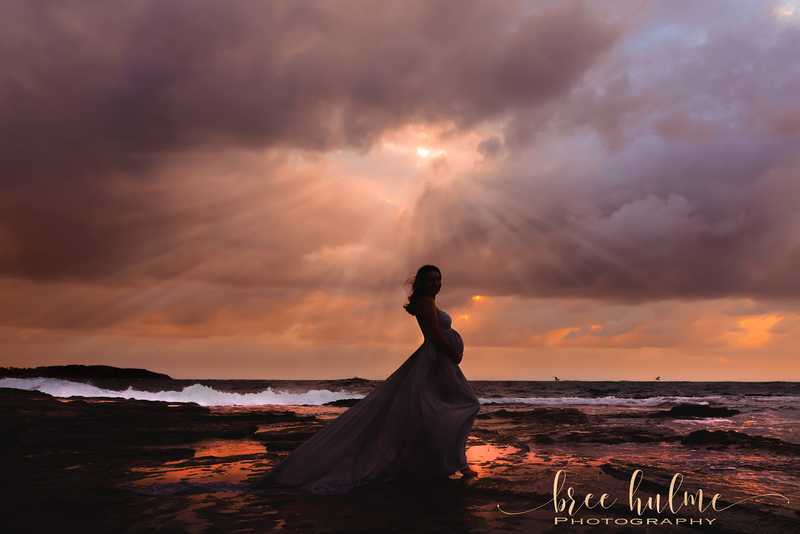 I highly recommend looking at Mama Rentals and their large selection of maternity dresses for hire to use during your session. 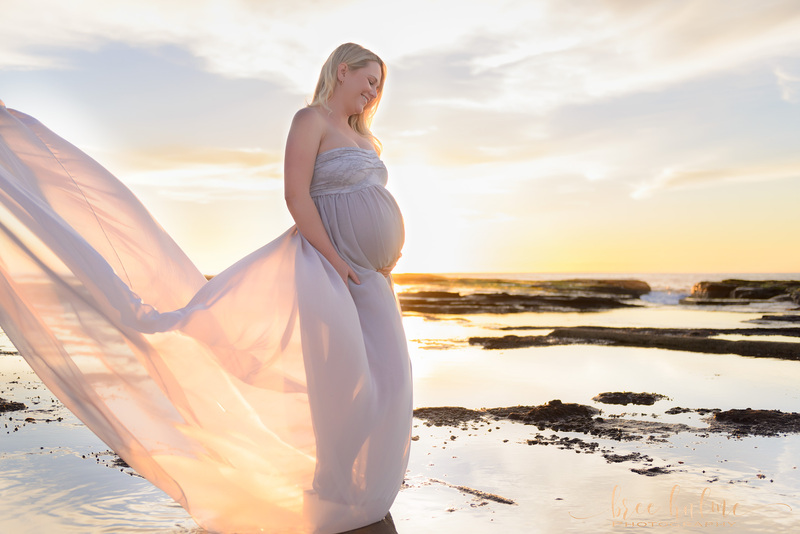 You can see more of my maternity portraits in my Maternity Gallery.